I noodled around several different title options before picking one because I didn’t want it to be misleading. 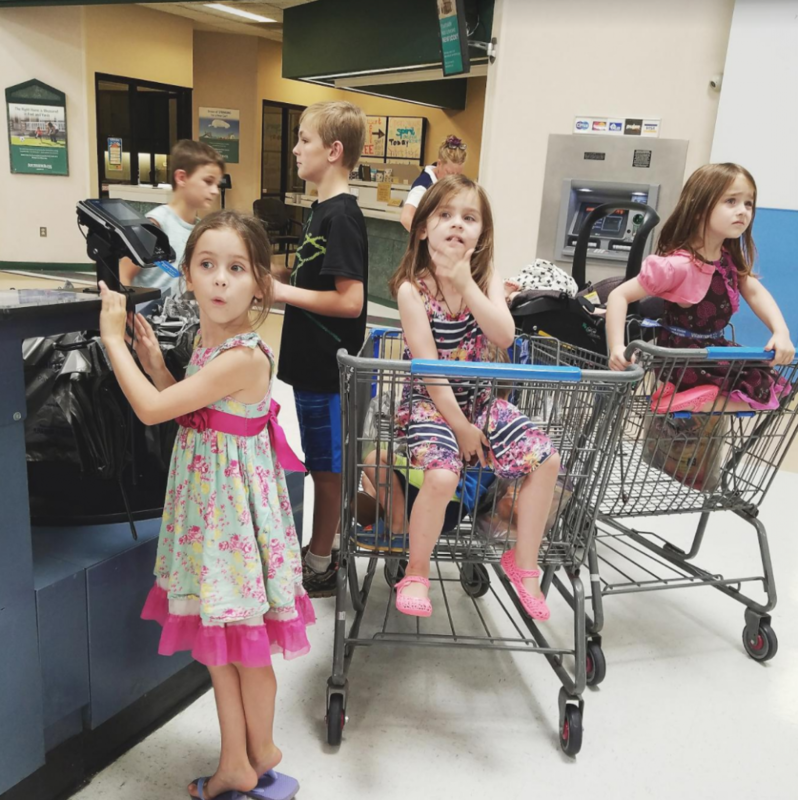 This post is not about THEE cheapest way to shop if you have lots of kids. Or about coupon clipping. Or about the best, most filling meals for the least amount of money. 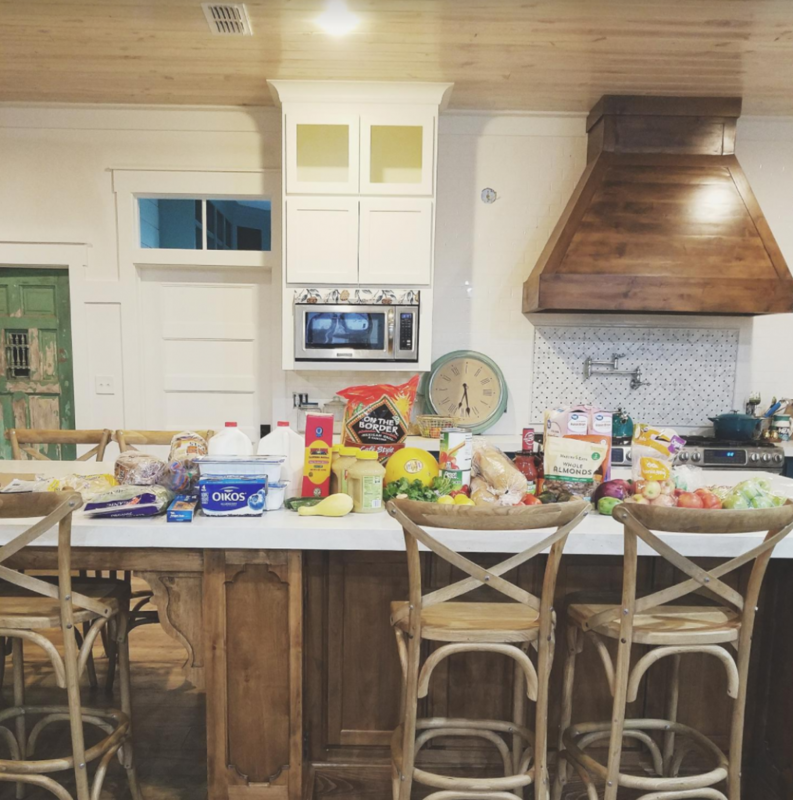 Elements of most of those things are in here, but more than anything, I’m writing this post in response to several questions I’ve received about what the process of feeding a family of 9 looks like. 1. How often a week do you shop? I do one big haul a week–usually on Saturday mornings. And then, we supplement as needed with a quick stop or two throughout the week. The “big haul” day has rotated through the week throughout the years (we even went together as a family immediately after church for a while there), and historically, I’ve had ALL the kids when I go (many moons ago, when the kids were all smaller and much less helpful, I used to stop on Monday evenings…after teaching two hours of classes at the gym. Because, apparently, I’m a masochist??). Lately, I’ve been heading to town on Saturday mornings for a free Cross Fit community WOD (workout of the day) and then shopping immediately after. NO KIDS. Because the oldest ones are mature enough now to do basic younger sibling maintenance (Honor’s down for a nap) while Shaun does projects around the house. Are there words to adequately describe the sheer joy of grocery shopping alone? I’m not sure there are. But “bliss” comes to mind. Shaun’s been traveling a fair bit recently, so the kids were with me on a random Tuesday. We always have two baskets and take up a fair bit of space, but they are genuinely helpful (I don’t load the belt or bag groceries) and definitely know the drill after years and years of tagging along. My favorite thing about this picture is that, as I was looking at several that I took from my phone, the lady with the white hair in the back is staring at us with that same bemused expression in every single one. Ha! 2. How much do you spend? This is the one everybody wants to know, right? I mean, we’re feeding 9 people. Surely, we must be spending a fortune. Of course, with 4 (almost FIVE!!! )-year-old twins, a 2-year-old, and a newborn, half of my people don’t actually consume that much in terms of volume yet. But the amount feels like it increases on a weekly basis, which makes me nervous. Our typical bill for the “big haul,” including some non-food items (so, a package of toilet paper, or a box of diapers) is about $190. Obviously, there are some weeks that all of the extra stuff comes “due,” and the bill is considerably higher. If we were to stick to that every week, that would be a pretty incredible budget for such a big family. But we always end up stopping at least one more time to grab a rotisserie chicken + fruit + milk, etc. Most weeks, we spend another $50 at least. This particular load was about $135. I usually get more of most things (like bagels and yogurt), but we were still stocked on those from a previous trip. 3. What do you eat every week? I’m sure this is true of most folks, but we eat basically the same thing every week. Cereal, bagels, or eggs for breakfast, yogurt and fruit for snacks, sandwiches or leftovers for lunch, and an ever-repeating rotation of about 20 dinner options that use a lot of the same ingredients. Turkey spaghetti (my kids would eat my spaghetti–you can find the recipe for my sauce at the beginning of my lasagna recipe–every single day). For reals. Turkey burgers + homemade sweet potato fries + homemade guac (one of my fave meals ever that I eat without a bun and with all the fixin’s on the side). We don’t do much in the way of prepacked foods, but neither do I make complicated meals. 4. What ingredients are you never without? You’ll pretty much never find us out of: diced tomatoes, tomato sauce, limes, cilantro, avocados, OTB Corn Chips, cheddar cheese, black beans, onions, tortillas, raw chicken, and raw ground turkey (obviously those last two get cooked quickly, usually in batches for the entire week). We are a Tex-Mex family, apparently, and I make homemade salsa (it takes 5 minutes and is SOOOO good) and guacamole on the daily. If I’m in a pinch for dinner, we’ll probably be eating burritos and black bean salsa or spaghetti that night. Bonus points if you can a) spot Theo or b) figure out why Nola looks so distressed (probably, she just heard that we weren’t having “her favorite spaghetti” for dinner that night). 5. How much do you eat out? In the past, not very much. We still don’t do tons, but we’re a little “looser” than before. Shaun and I have a “date night at home” every Thursday night when my mom has Ezra, Simon, and Della at her house. We get the four littles in bed by 7:30 and settle down on the couch with takeout Thai food to watch an episode of Fixer Upper or Vera (British crime show). Once a week (usually on Fridays after I teach Combat or a Tuesday night if Shaun’s out of town), the kids and I will have lunch or dinner at Chick-fil-a. And we usually eat out lunch on Sundays. Plus, we go pick up the big kids from my mom every Friday night, and she fixes dinner for us + my brother’s family. So, I typically cook (or at least prep some kind of food) 5 nights a week, with Thursdays and Fridays off. If I moan even a little bit about cooking on Sundays, Shaun orders pizza. 5. Any brilliant money-saving tips? I used to religiously scout out the sales in the local ad papers and then take them to Walmart for price matching. My mom just told me that Walmart isn’t honoring competitor ads anymore, but I haven’t done this for a couple of years anyway. I did save a fair bit sometimes, but I also found that–outside of a $0.99/lb sale on grapes or some other produce–most of the things we buy regularly at Walmart were pretty comparable to the sales I usually saw. 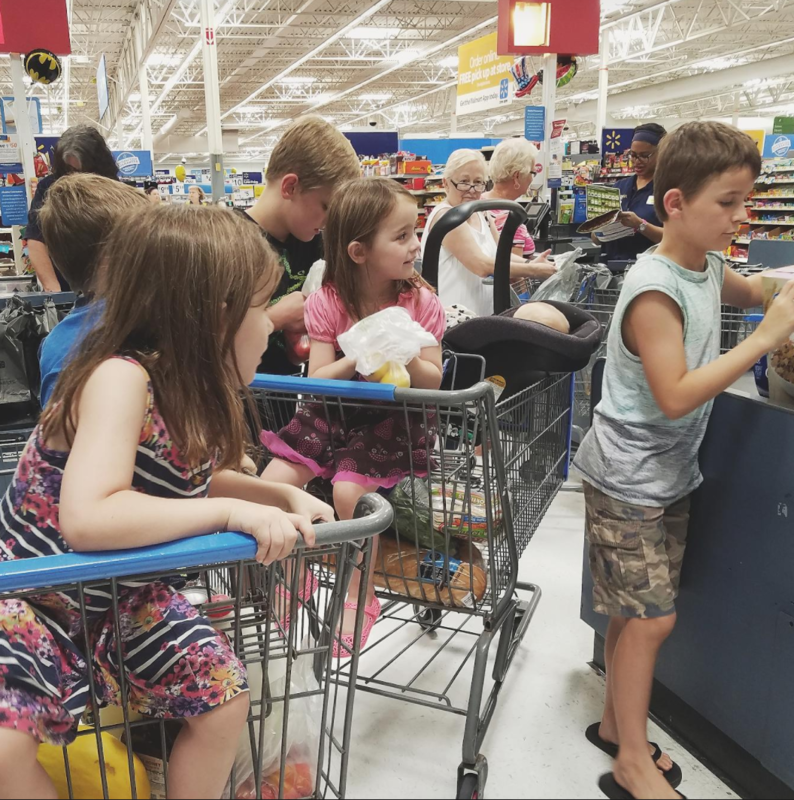 We also used to shop at Sam’s Club, but we’ve been in such a busy season of life for so long that the extra effort of driving out there (it’s a ways from our house) and spending at least an hour grocery shopping–usually on a Sunday–just wasn’t worth it to us. We may renew our membership in the future, but for now, we’re keeping it simple. As to coupons, I just don’t. I know I could save a lot of money, and, of course, I use the ones they include on the yogurt packages, etc., but I don’t actively buy items based on whether they have coupons available. I think my best way to keep our food bill decent is to buy inexpensive, simple food and do a fair bit of cooking. Cheaper AND better for you! So, there you have it, folks! What grocery shopping for 9 looks like around here. I know this will continue to evolve as the kids get older/eat more. I’m seeing lots more beans (and flatulence…) in our future. What does grocery shopping look like at YOUR house? Move-it Monday: Egg Muffins = Breakfast Gold! In case you haven’t heard, whether you’re an exercise fiend or a couch potato (or anywhere in between), breakfast is your most important meal of the day. And with a title that literally means to break your fast, it’s no wonder. Google a phrase like “important breakfast,” and you will discover no end of articles trying to convince you that a Pop-Tart and a cuppa joe aren’t going to do you any favors in the mental, physical, or spiritual department (even if you’re in a pop-tart cult, which…if you are…I don’t want to know). That, and you might get some pictures of some foreign dignitaries with hollandaise sauce on their $200 ties. Anyhoo, my point is that, while a more substantial breakfast may not be any more spiritually uplifting than a crumbly frosted pastry filled with strawberryish goo, the fuel it provides can help you think more clearly and exercise more effectively, not to mention staving off the 3 p.m. Nacho Dorito munchies. Well, breakfast is your body’s signal to start being itself again. In fact, experts say that eating something worthwhile within a 2-3 hour span of waking is one of the best ways to give your metabolism a jolt, since that “something” snaps your body out of the energy/food conservation mode it enters every night as a part of your natural sleep cycle. Also, breafkast-eaters tend to consume fewer calories overall throughout their day than breakfast-forgoers. Bacon, egg, and cheese muffins. Whooooooaaaa! Hold up! Come on back here. Before you dive for your keys and head to the nearest McDonald’s drive-thru (the blog lady made me do it! ), here’s an important word that perhaps I should have included in my above description: homemade. Homemade TURKEY bacon, egg, and low-cal cheese muffins are a wonderful, filling, reasonably healthy option for breakfast that, at only 250ish calories for one, will leave you plenty of room for a modest snack when/if you feel a little peckish before lunch. And, what’s better, if you make them in batches like I do, they will save you mucho on both time and money. Considering that we’re talking about bacon, egg, and cheese muffins, nothing in this picture should shock you. **Note: One dozen scrambled eggs usually yields about 14 muffins. 1. Crack one dozen eggs into a bowl, add 1/4 cup of milk, and generously sprinkle with salt/ pepper (I basically just shake until I have a good coating of both on the surface of the eggs, but be careful with the salt as you can easily go overboard and can always add more later if need be). 2. Enlist an adorable helper (who thinks that wearing shirts is always optional) if you’ve got one handy. 3. Scramble your eggs over medium heat in a large pan with 1/2 tbsp of olive oil. 3. Place as many pieces of bacon on a paper towel as will fit, and microwave on high somewhere between 2 1/2 – 3 1/2 minutes (depends on how your microwave nukes things). 4. Lightly (I use a TEA—not table—spoon, tops) butter both sides of each muffin, and slide them onto the top rack of the oven on broil (high) for a couple of minutes. Note: these crisp up super-fast, so keep an eye on them. 5. Set out your prepared ingredients, and stack your muffins up, assembly-line style (I usually do: muffin bottom, 2-3 tbsp of eggs, 1 slice of bacon (halved so it will fit), 1 slice of cheese, muffin top, but you can get as wild and crazy with your order as you like…although, I wouldn’t recommend bacon, eggs, muffin, muffin, cheese, or anything like that). 6. Once they’ve cooled, either individually wrap each sandwich in cling wrap and then place it in a gallon freezer bag (I can usually fit around 7) or just carefully stack/wedge them in the freezer bags and deal with the odd egg bit or two (or twenty when you grab the bag carelessly out of the freezer and fling it on the counter…oops) that escapes. 7. Grab a sandwich from your freezer first thing in the morning, nuke on high (be sure to remove it from the cellophane first if you wrapped it up…mmmm….chemicals) for about 30 seconds, and chow down! For those of you wondering why there’s no coffee in that cup…yeah…I can’t stand the stuff. Feel free to post a rant in the comments section. Kind of a big difference, I’d say. Not to mention that these yummy sammies will save you from waiting in the drive-through with all the other late-for-work commuters. This is just my little trick for easy protein + filling tastiness to get my day started off, but I’d love to hear what kind of breakfast gets you moving in the morning! Oh, and come on back tomorrow for Try-it Tuesday!